While bringing home bunny is a momentous day in your household, it's important not to overwhelm your little friend with too much activity at once. Give him time to get used to his new surroundings and acclimate to your home. Until he does settle in, he might not reveal his true personality. That initially shy rabbit might become quite friendly once he's comfortable. Set up a safety pen prior to bringing home your bunny. The pen should include hay and water, as well as a litter box filled with shredded newspaper or litter specifically designed for rabbits. It should be in a quiet area and off-limits to other household pets. If you bring your rabbit home in a carrier or box, put the container inside the pen and open the door or box top. Let him venture out on his own -- it could take a while. After a few days, let your rabbit out of his pen or cage to explore his surroundings in your home. This is a good time to start gently playing with him. Never let a rabbit out unsupervised -- chewing is second nature to rabbits, so items like electrical cords are just potential disasters waiting to happen. If you have a dog, keep him away from your rabbit at all times. Even the exceptional canine who won't go after a bunny as prey can scare a rabbit to death just by her presence. Sometimes, a cat and an adult, full-size rabbit can occupy the same space while you are supervising. It's not a good idea to try introducing a baby or dwarf bunny to a feline. 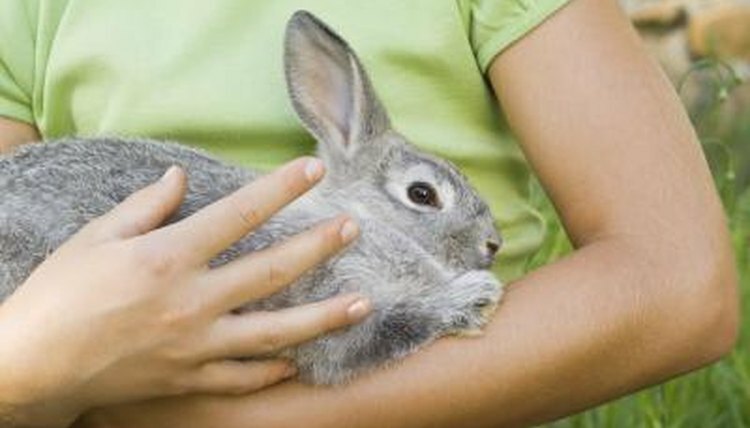 Although your new rabbit appears quite cuddly, most bunnies aren't keen on being held. As prey animals, being held off the ground and immobilized makes them feel insecure and scared. They can struggle so much they break their backs. Let your bunny get used to you initially without a lot of handling. Speak quietly to your rabbit so he becomes accustomed to your voice and learns to trust you. Pet him gently, but avoid making sudden movements or loud noises. If there are kids in the house, teach them to be gentle and quiet around the bunny and not to overwhelm him with attention. Establish a routine to make your bunny comfortable. He should anticipate his feedings, playtime outings and grooming. Rabbits groom themselves and can ingest a lot of hair. Brushing him for a few minutes daily keeps the shedding hair out of his digestive system, while helping him bond with you. Make sure your bunny always has timothy or grass hay available, as well as fresh water. You can give him small pieces of carrot or fruit as treats, but leafy green veggies should be a regular part of his diet. He also needs non-toxic pieces of wood to chew on.